QUEENSBURY and HENDERSONVILLE, Tenn. — It is with our deepest sorrow that we announce that Christopher John Blackburn, our beloved son and brother, went to the arms of the Lord on Saturday, Feb. 2, 2019, after a long battle with cancer. Chris was born on Jan. 2, 1966 in Glens Falls. He was the youngest son of Loren H. Blackburn and Joan L. (Prairie) Blackburn. Chris graduated from Queensbury High School in 1985 and attended Crane School of Music until 1989, when his love of music inspired him to relocate to Nashville, Tennessee to pursue a career in music. Those who knew Chris saw how inspired he became of all types of music at the age of 10, learning voice, acoustic and electric guitar and piano. Chris was especially influenced by Elvis Presley and his music. In 1990, he relocated to Nashville to start a professional music career playing and writing music. In addition to starting his career, Chris also worked at Tennessee Valley Exterminators as a technician for 17 years, where he enjoyed meeting and servicing their customers and building relationships. 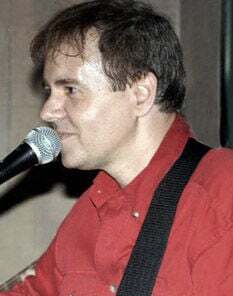 In the early 90’s, Chris formed “The Chris Blackburn Band” with four of his closest friends, playing throughout Nashville area in restaurants, night clubs and casinos for 26 plus years and always had a loyal following. During Chris’ career, he produced three music CDs with both SMS Studio and the Project Room Studios. He was most proud of all three CDs, which were filled with original music and remakes of some of his favorite artists and songs. When Chris became ill, he wanted nothing more than to be with his mother and family that he loved so much. Our family would like to extend a sincere thank you for all the compassionate care that Chris received from the Oncology staff at Glens Falls Hospital, High Peaks Hospice nurses and his new family from The Haynes House of Hope staff and volunteers, whom are truly angels from above. Throughout his life, Chris was always very spiritual and wanted to thank Father Tom for his many visits, which brought much comfort to him. Chris was always so appreciative of his “sweet sister,” Val, for her daily care in taking him to appointments and always making sure that Chris‘ needs were met on a daily basis. Chris was predeceased by his father, Loren H. Blackburn. Survivors include his mother, Joan L. Blackburn of Queensbury; brothers, Kevin and his wife, Lorraine, (Baldwin) of West Fort Ann and Brian and his wife, Andrea, (Cushman) of Queensbury; his sister, Valerie (Blackburn) Romleski and her husband, Daryl, of Queensbury; his nieces and nephews, Philip (Amy), Stacy Blackburn, Taylor, Alanna, Sage Blackburn, Kory Randall and Joshua (Mackenzie) Romleski; and grand-nieces, Adrianna and Mandy. “The best thing you can possibly do is to be good to people” was one of Chris’s favorite sayings. A private Mass will take place for the family. Burial will be at the Saint Alphonsus Cemetery at a later date. Arrangements are being made by Singleton Sullivan Potter Funeral Home, 407 Bay Road, Queensbury, and those who wish may make online condolences by visiting sbfuneralhome.com. Memorial donations can be made in Chris’s memory to the Haynes House of Hope, 7187 NY-149, Granville, NY 12832.